Inquiring minds are digging into the Federal Reserve Manufacturing Report for the 10th District Region. Note the near clean sweep in the negative sense. 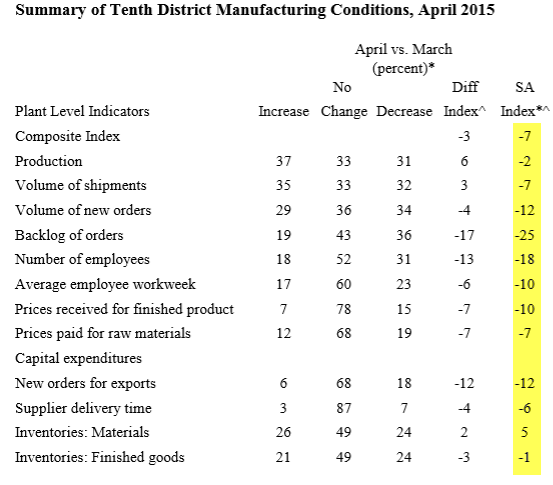 Actually, inventories of materials rising in the midst of a decline in orders is not a good thing either. New orders, backlog of orders, employment, and length of workweek have all crashed. Prices paid and received are deflationary. We are experiencing more volatility on revenue monthly. One month may be much higher than previous month or year and then the next month may be much lower, etc. 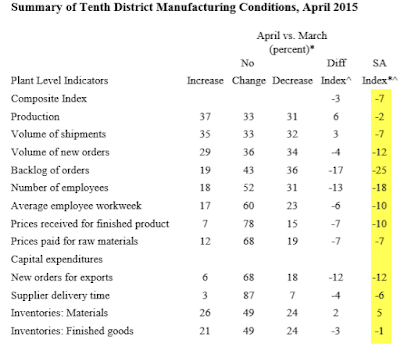 The durable goods sector just isn't very good, impacted mightily by the price of oil. We are reducing headcount and spending where possible in an effort to withstand this phase of the economy for however long it lasts. Competition for business is fierce especially with the low cost labor and better logistics from Mexico. We are finding more and more customers moving manufacturing operations to Mexico. The manufacturers in the energy producing states are struggling to make adjustments given the speed at with oil prices dropped. Raw material suppliers have announced large increases in price, however, they keep moving the effective dates back. These announced increases are not supported by actual cost increases. Their sales are down so we are not taking the announced increases are seriously. If they do go into effect, our larger inventories will be a cushion. West coast port disputes have us out of stock on key items. No information available on when we will receive products. We will look at reducing our employee count next month if we do not receive goods in April. We import dry bulk cement from Asia and Europe so the strong dollar has given us more buying power. We also export the same type products to Canada where the strong dollar has hurt our margins and made it harder to compete. The strong dollar is good in that it's driving down commodity prices, but bad because it is making us less competitive globally. We're making fewer products but making more money on them. It has been bad for our employees because we have less work (and fewer employees). Overall , it’s a negative for us. The stronger dollar is undoubtedly creating more opportunity for foreign manufacturers. The impact has only begun to be felt in our bookings. Comments number two, three, and nine are telling. I stick with my assessment made in January and commented on twice recently. Credit Crunch Underway: Can Recession Be Far Behind? Déjà Vu Weather? No, It's a Recession!